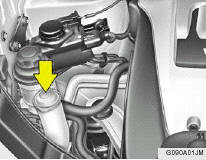 The washer fluid reservoir supplies fluid to the front and rear washer systems. A good quality washer fluid should be used to fill the washer reservoir. The fluid level should be checked more frequently during inclement weather or whenever the washer system is in more frequent use. The capacity of the washer reservoir is 3.59 U.S. quarts (3.4 Liters). CAUTION: o Radiator anti-freeze (engine coolant) should not be used in the washer system because it will damage the car's finish. o The washer should not be operated if the washer reservoir is empty. This can damage the washer fluid pump. WARNING: o Windshield washer fluid agents contain some amounts of alcohol and can be flammable under certain circumstances. Do not allow sparks or flame to contact the washer fluid or the washer fluid reservoir. Damage to the vehicle or its occupants could occur. o Windshield washer fluid is poisonous to humans and animals. Do not drink windshield washer fluid. Serious injury or death could occur.